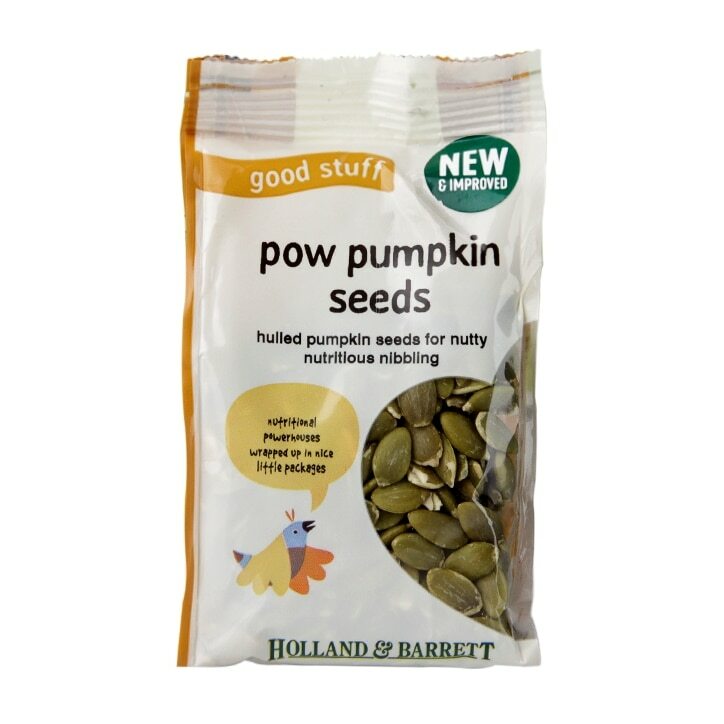 Holland & Barrett Pow Pumpkin Seeds are nutritional powerhouses wrapped up in nice little packages. Pow! Delicious and nutritious, these hulled pumpkin seeds are also packed full of phosphorous and potassium. Sprinkle them on just about any food you like for a natural crunch! We recommend adding to your salads, yoghurts, porridge or when baking muffins. Sourced from China and carefully checked and packed in the UK, you won't find better quality, great value pumpkin seeds (if you do we want to know about it!). Give our Pepita a go; that's Mexican Spanish for pumpkin seeds, you know? Holland & Barrett Pumpkin Seeds is rated 4.7 out of 5 by 145.